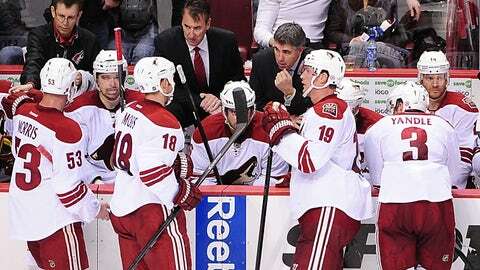 The Coyotes have averaged just 2.41 goals over their last 34 games and are now 16th in the league in scoring. Remember when the Coyotes were scoring goals in bunches earlier this season and keeping pace with the Western Conference elite? Remember how coach Dave Tippett warned that it was masking significant issues in the team’s play? That’s the thing about scoring ability: It can mask deficiencies and make up for mistakes. The Coyotes have been playing better defensively in recent games. They’ve allowed just 16 goals in their last eight games. In the two games since the Olympic break they’ve taken early leads at Winnipeg and Colorado. That’s normally a good sign for any NHL club. Only two teams (the Sabres and Islanders) have a sub-.500 winning percentage when scoring first, while 25 of the league’s 30 teams win more than 60 percent of the time when scoring first and about half win 70 percent of the time or more. But the Coyotes lost both of the aforementioned games for one very problematic reason: They couldn’t push the game along by adding to their lead. Why? They still do not have enough elite offensive talent at the forward position. Pore over the NHL’s scoring leaders. The Coyotes do not have a player among the NHL’s top 60 in points and do not have a player among the top 30 in goals scored. How many other teams boast that dubious distinction? Just two: the Panthers and Sabres, who have been in sell mode for months because they are way out of the playoff picture. It’s why Phoenix was so desperate to sign center Mike Ribeiro this offseason despite well-chronicled shortcomings in his defensive and faceoff ability as well as long stretches of games when he seems to lose focus or effectiveness (and even composure, as he did Friday in Colorado when he took 14 minutes in penalties). "Sometimes he gets caught up in the emotion of the game, and the referees made him pay for it," coach Dave Tippett said after the game. "That’s disappointing, because ‘Ribs’ can be a really good player for us if he just plays." Scouting the Blues: St. Louis pulled off a major trade on Friday that will crown the Blues as one of the NHL’s favorites to win the Stanley Cup. They acquired goalie Ryan Miller and super pest Steve Ott from the Sabres in exchange for goalie Jaroslav Halak, forward Chris Stewart and prospect William Carrier, plus first- and third-round draft picks. Miller and Ott should be available to play on Sunday. 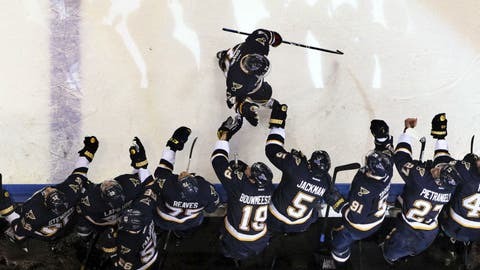 The Blues’ special teams both rank in the NHL’s top six, and they have allowed the third-fewest goals in the league (137) while scoring the third-most goals (196). All of the pieces appear to be in place, which will add heavy expectations to a franchise that has never won the Cup. St. Louis had dropped both its games since returning from the Olympic break by identical 1-0 scores. Ribeiro still leads the team in points (41), but with the Coyotes in 11th place in the Western Conference, nobody can make the argument that the nine-month-old Ribeiro experiment has cured the Coyotes’ ills. Is that all Ribeiro’s fault? No. He didn’t work well on a line with Mikkel Boedker earlier this season because, as Tippett noted, Ribeiro likes wings who can go get the puck for him. That’s a shame, because Boedker has shown signs of breaking through and could use an elite setup man to play with. But there’s no denying Ribeiro has made the Phoenix power play more effective. The Coyotes rank eighth in the NHL at 20.8 percent with the man advantage, and they’ve scored a power-play goal in 18 of their last 19 games. Part of that is the offensive abilities of defensemen Keith Yandle and Oliver Ekman-Larsson, but Ribeiro draws the defense’s attention on the power play, creating space for others. "Have there been times when we expected more from Mike? Yeah, but look at the great production we’re getting from (centers) Marty Hanzal and Antoine Vermette," Coyotes assistant GM Brad Treliving said. "There is something to be said for slotting guys into their proper roles and creating different matchups. Our power play has been an issue for years, and now we have a top-10 power play. When you dive deeper into the analysis and really dissect it, there’s no question Mike has had an impact on our team." Still, the Coyotes have struggled of late because they can’t finish with consistency. On Dec. 1, the Coyotes were sixth in the league in goals scored. As of March 1, they sit 16th. After scoring 85 goals in their first 26 games (3.27 per contest), they’ve scored 82 in their last 34 (2.41). The troubling aspect of this slump is that it’s nothing new. It is fair to say that the Coyotes have not drafted and developed an elite offensive forward since arriving in the Valley in 1996. The draft/development sins of the regimes of past GMs Bobby Smith and Mike Barnett have been well documented. Daniel Briere was traded away before he blossomed. Scott Kellman, Krys Kolanos, Fredrik Sjostrom and Jakub Koreis never panned out. Peter Mueller never matched his rookie production, and he was traded before his career ruined by concussions. But there have been mistakes by the current regime as well. The organization never could come to an agreement with Blake Wheeler, who now leads the Jets in points (49), and they had to deal away Kyle Turris, whose development was stunted by an early call-up and who then became a locker room cancer. Turris has 44 points this year in Ottawa. Free agency is clearly a means to fix some of a team’s shortcomings, but if you don’t draft and developing elite offensive talent, the evidence suggests you won’t be successful. Take a look at the Western Conference’s elite clubs of the past few years. Chicago drafted Jonathan Toews and Patrick Kane before adding Marin Hossa in free agency. Anaheim drafted Ryan Getzlaf and Corey Perry. San Jose drafted Joe Pavelski and Patrick Marleau. Los Angeles drafted Anze Kopitar. St. Louis drafted T.J. Oshie and David Backes. Vancouver drafted the Sedin twins and Ryan Kesler. While the current management team has done a laudable job of building the team’s blue line, the best offensive forwards the Coyotes have drafted and kept in that span are Boedker (39 points) and Hanzal (37), who have both posted career highs in points this season. You need to draft and develop your own players to have success, and we know that’s an element we’re missing. There is hope within the organization that this drought could finally be coming to an end with the drafting of Lucas Lessio in 2011, Henrik Samuelsson in 2012 and both Max Domi and Laurent Dauphin in 2013 along with the acquisitions of Tyler Gaudet and Tobias Rider. But how close is that hope to being realized? Dauphin is playing with Chicoutimi in the Quebec Major Junior Hockey League, Domi and Gaudet are playing junior hockey with London and Sault St. Marie, respectively, in the Ontario Hockey League, and Samuelsson is playing with the Edmonton Oil Kings of the Western Hockey League. Only Lessio and Rider are with Portland of the AHL, where Lessio has 18 goals and 36 points while Rider, a rookie, has 20 goals and 34 points. "You need to draft and develop your own players to have success, and we know that’s an element we’re missing," Treliving said. "I don’t want to throw stones at anybody in the past, but it takes time and Mikkel is the perfect example. I think he’s taken more strides this season but that next step is to become a difference maker in important games." "It would be a tough leap for Max and Henrik and Laurent to jump to the pros next season and make an impact, but there have been players who did it before, and Max is a special talent who will be a year older and a year stronger next year. At the same time, we don’t want to sit here and wait for them to come and save us all." There’s also no guarantee those players will pan out at the pro level, so the focus will continue to be on improving organizational depth at forward in the draft. In the meantime, the Coyotes’ margin for error remains razor slim on most nights, because they don’t have the difference-makers to put the puck in the net on a regular basis and wipe out some of the mistakes that are bound to occur over the course of a game.